Victoria Falls, arguably Africas greatest natural wonder, with often overlooked Botswana and incredible Cape Town, what a tour! There is something almost haunting about Africa and everyone should visit it at least once during their lives. Its sense of vastness and isolation, whilst at the same time a unique closeness to nature, leaves an indelible mark on its visitors and on this incredible three-country tour, you see some of the very best it has to offer. We see one of the finest natural wonders on the planet, the amazing Victoria Falls as well as one of its most naturally beautiful cities, Cape Town, with its surrounding fertile Winelands, plus we visit one of the worlds finest and least visited game reserves, all set in the beautiful countries of Botswana, Zambia and South Africa. Our tour starts in Zambia, adjacent to the spectacular Victoria Falls, or as the locals call it – Mosi-oa-Tunya, the Smoke that Thunders! It may be a clich, but the falls really do take your breath away and it is at places such as this, that visitors realise just how powerful Mother Nature really is. The statistics are awesome: three times as long as Niagara and twice as high, this is the largest single body of falling water in the world! At times of peak flow, the spray rising from the abyss is too thick to even see the foot of the falls, whereas during the dry season (generally Sep-Dec) the more adventurous may be able to walk to the edge of the vast chasm or even bathe in one of the pools next to the rim itself! Nearby Botswana is a wild and beautiful country and remains one of the few places on earth that really is unspoilt  a true wilderness where animals are free to roam and migrate freely along their traditional routes. Botswanas Chobe National Park, a huge reserve of over 10,500 unfenced square kilometres is renowned for having the greatest concentration of game, particularly big cats, in the whole of Southern Africa, and a safari here is a truly exceptional experience. The Chobe River, an integral part of the ecosystem, allows for superb close-up viewing of a huge variety of animal and indigenous bird species. Fish eagles are common and can often be seen swooping low over the waters, their stillness broken only by families of hippo. But what makes Chobe so special, is that it is home to the worlds largest concentration of elephants, well over 100,000 of them, all protected for over a hundred years. It is a moving and an almost humbling experience to see them inter-acting with each other: playing, bathing and splashing in the blue river, as depicted on countless TV documentaries. Then for a complete contrast, its on to South Africa and stunning Cape Town set in a breathtaking location. Backed by ever-present blue skies and the iconic Table Mountain, fringed with white sand beaches and the nearby fertile, seemingly never-ending valleys of the Winelands, it is blessed with a surfeit of world-class natural wonders. South Africas Mother City, Cape Town was the first settlement founded by Europeans and now its a lively, cosmopolitan and bustling centre, with superb restaurants and excellent shopping, especially within the tastefully restored Victoria and Alfred Waterfront. Explore the Bo-Kaap district, one of the citys most vibrant quarters with its unique Cape architecture, home to jazz clubs and artisans. Take the revolving cable car to the top of Table Mountain, visit Robben Island where Nelson Mandela was incarcerated for much of his life and visit the Cape of Good Hope – the southernmost point on the African continent. Our tour offers incredible variety: the amazing natural wonder of Victoria Falls, the enthralling safari experiences of Botswana and the sophisticated style of Cape Town. You will return home with some wonderful photographs and incredible memories: an invigorating and uplifting reminder of how wonderfully diverse and beautiful our planet really is. After your morning arrival you will connect with your onward 1 hour 50 minute flight to Livingstone in Zambia and our hotel for the night, the three-star superior Azani Victoria Falls resort, located just a short walk from Victoria Falls. All rooms are air-conditioned and brightly decorated in an African theme with a balcony or patio overlooking the extensive landscaped gardens. The resort has a large pool, bar and restaurant and Riviera guests are welcome to use the excellent restaurant, bar and facilities of the five-star Royal Livingstone Hotel next door. After some time to relax and freshen up, we experience one of the highlights of your tour  a sunset cruise along the mighty Zambezi on the African Queen. As the boat slowly glides across the expanse of a river inhabited by hippo and crocodiles, why not settle into a shaded wicker armchair, absorb the unique surroundings, sip a refreshing drink, become acquainted with your fellow travellers and reflect on how good life can be! 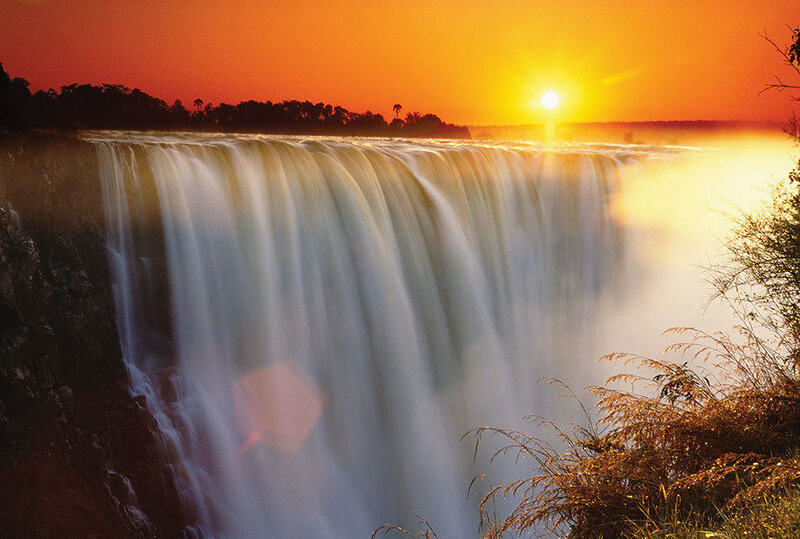 This morning we approach Victoria Falls for an outstanding guided walking tour. The area around the falls is surrounded by a unique, lush rainforest eco-system, watered by the fine spray rising from the falls. As we pass through several rainbows arching through the mist, the roar of the falls intensifies and conversation becomes virtually impossible. The anticipation mounts and on your first view, you will fully appreciate why this is truly one of the wonders of the natural world! During low water flow, an optional boat trip is available to Livingstone Island from where the famous explorer himself first saw the falls. For the ultimate view you can take a helicopter or even a micro-light aircraft flight (essentially a powered hang-glider) on an optional Flight of Angels tour. During the afternoon we drive west parallel to the Zambezi until it joins the Chobe River, actually forming the Botswanian border, which we cross on small open speedboats. We stay three nights half-board at the four-star Chobe Safari Lodge. Note – some groups will stay at the four-star Mowana Lodge and some will stay at the Chobe Bush lodge. There is simply nothing to beat the feeling of excited anticipation and rising expectation as we start our game drive in the half light of an African dawn, accompanied by a unique dawn chorus. Using specially adapted 10-seater open-sided safari vehicles we look out for big cats, giraffe and elephants. You will see a wide variety of game: beautiful impala, monkeys, warthogs, kudu, even leopards if we are lucky! The birdlife is also simply superb  look out for the darting pied kingfishers, African skimmers, ibis, ground hornbills and a variety of brilliantly coloured bee-eaters. We return to our lodge mid-morning for some relaxation by the pool and a spot of lunch. During the afternoon we take a boat safari on the Chobe River, the main watercourse in the region. Elephant and hippo sightings are virtually guaranteed all year-round. Fish eagles and crocodiles are also often spotted, but during the peak of the dry season (Aug-Nov), hundreds of elephants congregate along the shore for their daily drink  an awesome game viewing experience, unique to Africa! As the sun sets beyond the wide grassy plains on the horizon, we are treated to one of this continents greatest gifts: the amazing multihued spectacle that is an African sunset. Today is at leisure at the Chobe Safari Lodge or Mowana Safari Lodge. You may either relax and enjoy the excellent facilities or take additional optional game drives or river safaris in this, the real heart of Africa. Alternatively, there is another optional, short excursion to Namibia just on the other side of the Chobe River or, you may wish to try your hand at fishing for the fearsome Tigerfish. This morning we drive to Cape Point, visiting the legendary Cape of Good Hope, originally known as the Cape of Storms. We pass pristine beaches, the fishing harbour of Hout Bay and continue along the breathtakingly scenic Chapmans Peak Drive, full of rugged seascapes and cliffs, to the Cape of Good Hope Nature Reserve, one of the worlds biodiversity hot-spots. At Cape Point itself you see the confluence of the Indian and Atlantic Ocean currents and the treacherous promontory of rocks, the scourge of mariners for centuries. Finally, you visit Boulders Beach and its resident penguin colony before returning to the city in the afternoon. Lunch is included today. Today you tour the awesomely beautiful Winelands. Set in a wide valley backed by majestic mountains, rows of manicured vines and orchards stretch into the distance, studded by lime-washed, often thatched, 300 year-old wineries built in the unique Cape Dutch style, sympathetically mirroring the undulations of the surrounding countryside. Later you visit the small town of Franschoek in a magnificent setting at the head of a valley, then elegant Stellenbosch, established 300 years ago and home to South Africas most prestigious university. Period buildings and historic streets reinforce the towns dignified atmosphere. We have time to explore this delightful town before enjoying a fascinating cellar tour and tasting at the award-winning Neethlingshof Wine Estate. Lunch is included today. Cape Town, featuring British, Dutch and Cape Malay influences, is simply one of the worlds most naturally beautiful cities, with so much to offer the visitor! Today is at leisure to explore as you wish. In addition to the excellent shopping and dining available within the Victoria & Alfred Waterfront complex, no visit to Cape Town would be complete without taking the revolving cable car to the summit of iconic Table Mountain, at the unofficial symbol of South Africa and with breathtaking views. You should also visit Robben Island (weather permitting), where Nelson Mandela spent most of his 27 years incarceration, and whose visitors have included Bill Gates, Margaret Thatcher, Bill Clinton and even Nelson Mandela himself. Wander through the Bo- Kaap area, the very image of small-town South Africa. Tours are available to charming nearby Hermanus, the worlds premier onshore whale watching location (Jul-Nov only). Alternatively, simply just wander where your feet take you, or relax a little, taking afternoon tea at the Mount Nelson, one of the great colonial hotels of the world: the choice is yours.